Eching, March 2017 – on March 13th 2017 NOVEXX Solutions received the AIM Case Study Award 2016 during an award ceremony of the AIM Summit 2017 in Stuttgart. 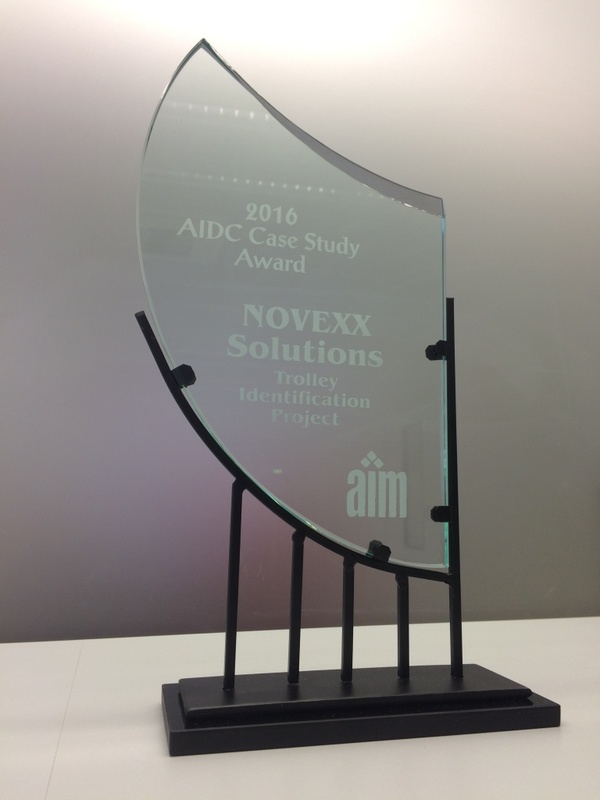 NOVEXX Solutions was chosen as the top entry in the Automatic Identification & Data Capture (AIDC) category for their submission ‘Trolley Identification’. Labeling hardware from NOVEXX Solutions integrated from their partner Top Label Printers BV, using a unique approach with new label material, offered an innovative labeling solution to the largest retailer in the Netherlands. Thanks to the combination of these new technologies, the retailer now has a much cleaner and HACCP compliant solution for mesh trolley identification in the distribution centers. NOVEXX Solutions was on site at the AIM Summit 2017 to accept the award and Jürgen Heim, Sales & Service Director NOVEXX Solutions, presented the winning case study during the afternoon session. One of the largest retailers in the Netherlands benefits from an innovative labeling solution for efficient mesh trolley identification in distribution centers. The customer has a large quantity of mesh trolleys to move goods to different stores on a daily basis. The turnaround time needs to be fast and they want to spend as little time as possible on cleaning and getting the trolleys back ready again. In the past the mesh trolleys were identified with normal self adhesive labels with thermal transfer printed packing content and shipping information. In order to be HACCP compliant the labels had to be completely removed from trolleys before reusing them. It was very time consuming and chemicals were needed for the cleaning process. A linerless label material is now used instead. For printing the labels 64-04thermal transfer printers from NOVEXX Solutions were installed in the distribution centers. In addition a cabinet was built to protect the printer against the rough environmental conditions in the DCs. The glue of the linerless material gets activated when putting two sides together. It only sticks to itself and not the metal grate. The printer is able to print on this material due to a special mechanical position of the print head and a silicone roller. Click here to view the official AIM press release.